⇒ Advanced 2D filtering techniques – remove form and apply roughness/waviness filters from 2RC to ISO 16610 – apply morphological filters using a straight or round structuring element – filter noisy profiles directly by editing the FFT plot within selected upper and lower bounds. ⇒ MATLAB™ compatibility – load or write MATLAB™ scripts and execute them to carry out custom operations including filtering. ⇒ Correct measurement anomalies – use data correction tools (thresholding, retouching, resampling) to eliminate anomalies and improve resolution prior to analysis. ⇒ Assess surface functionality – study the bearing ratio curve and depth distribution histogram to evaluate surface functionality – subtract profiles to assess wear. ⇒ Extract sliding profiles – extract subprofiles from a long profile to check tolerances in a sliding window. 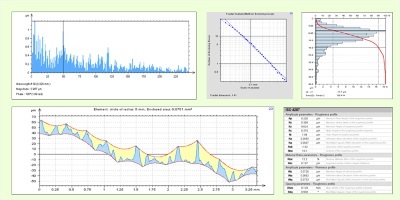 ⇒ Use FFT-based tools to analyze process-surface interactions and other surface characteristics – display frequency spectrum and power spectrum density plots – carry out autocorrelation and intercorrelation studies. ⇒ Fractal analysis – analyze the fractal dimension of a profile using the enclosing boxes and morphological envelope methods. ⇒ Overcome measurement limits virtually – join overlapping profiles to overcome physical measurement limits virtually, with automatic calculation of the overlap zone. ⇒ Statistical analysis of series of profiles or multiple profiles extracted from the same surface – load a series of profiles measured by 2D profilers or load surfaces measured by 3D profilers and extract one or more profiles for analysis – analyze series of profiles or multiple profiles extracted from the same surface statistically (trend plots, scatter plots, histograms) for process control or to achieve more reliable results.